I’ve made this once before, and it was surprisingly simple. I knew that all I’d really need to do was add a mashed banana, but I wasn’t sure whether that would upset the perfect balance that the cream cheese, sugar, eggs, and vanilla had created. But I saw that one recipe incorporated a little cornstarch to compensate for the banana’s extra moisture, which sounded like a good call. And it was. The cornstarch works quietly in the background, its presence undetectable. And, really, I’m not even sure if it’s truly needed or if it’s just banana paranoia on my part (and I can get deep into banana paranoia. I’ve gotten into arguments over it. Why are bananas the only non-juicy fruit? Fruits can usually quench my thirst but I get thirsty after having a banana. What isn’t Chiquita telling us?). 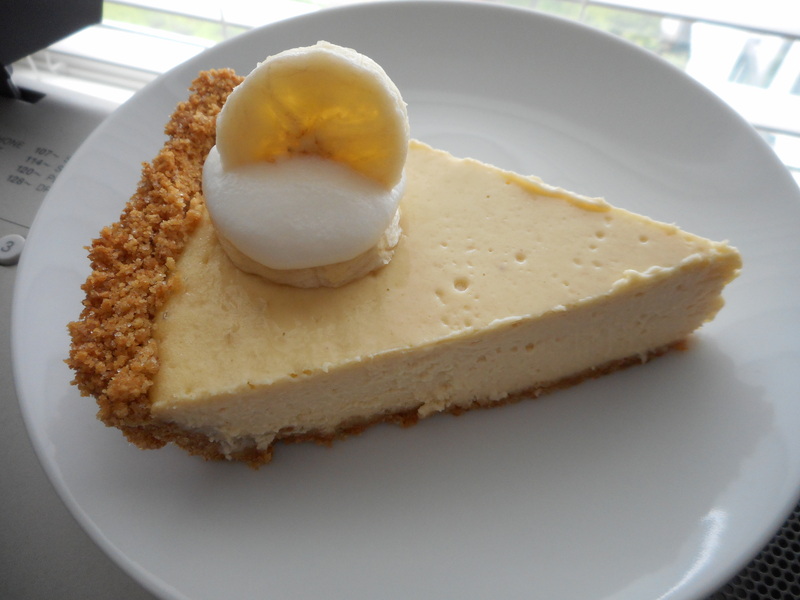 But even if the cornstarch isn’t helping, it’s certainly not hindering, so rather than go without and possibly ruin what could have been a perfect cheesecake, I’ll keep using it. My only note is to be mindful of the order in which the ingredients are added. 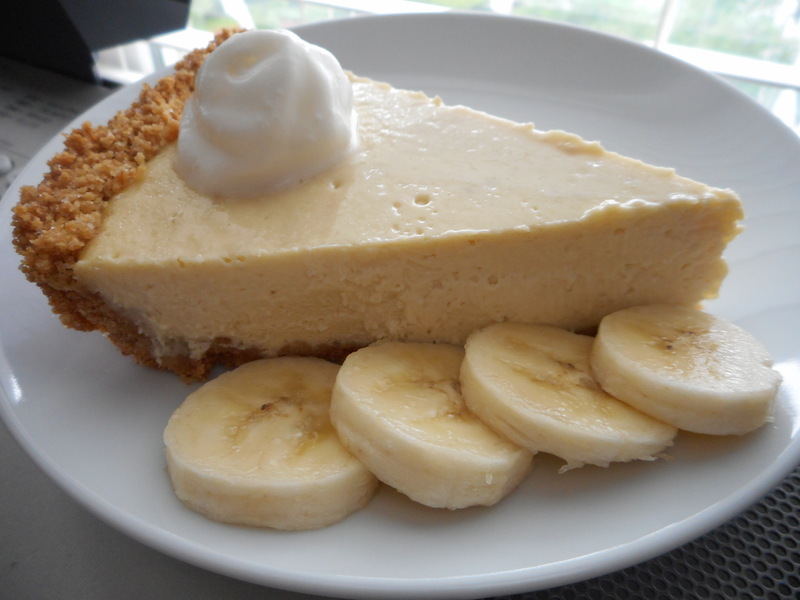 The first time I made this, I mixed together all the ingredients as if I were making a cheesecake as usual, and then I added the mashed banana at the end. It worked out perfectly. It was a much better plan than what I did this time, which was add the banana before the eggs. Eggs help make things smooth and fluffy, and without their stabilizing presence, there was chaos. The cream cheese, which prior to this had been creamed with the sugar and vanilla into a perfect blob of harmony, separated into tiny little lumps when I added the banana, no matter how much I whipped (maybe it shares my suspicion of bananas!). Adding the eggs couldn’t undo the mess, either, so I resorted to pouring the batter into a blender and letting it whip the lumps away. It worked, but resorting to a blender to make a cheesecake is a little much. So remember: bananas last. After that it’s business as usual–bake for about half an hour (mine needed 37 minutes) and take out of the oven when it wiggles a little in the center but is firm everywhere else. Let cool and top with whipped cream and/or banana slices if you want to be fancy. If I wanted to be closer to The Cheesecake Factory’s version, I’d have used crushed Nilla wafers in lieu of graham crackers for the crust. 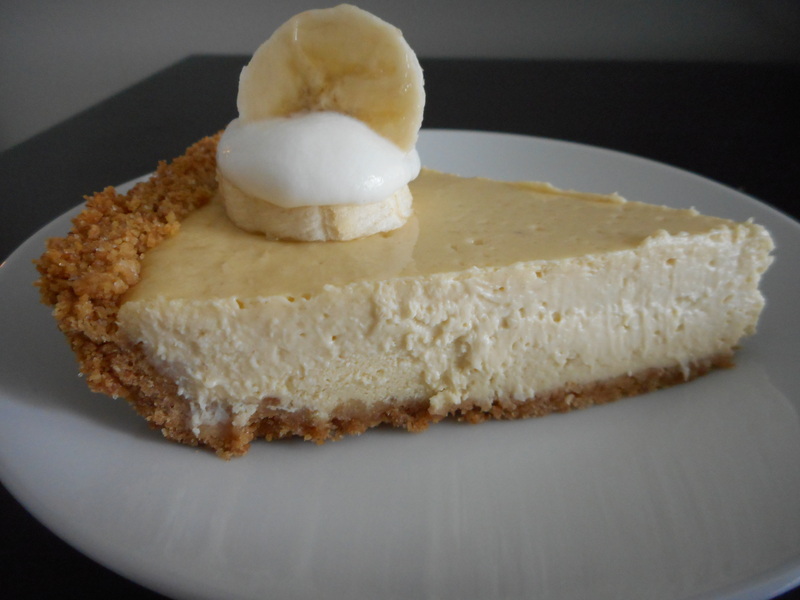 But I like the grittiness of graham crackers; I felt like using them would counterbalance the banana’s sweetness. Otherwise it would be a sweet cheesecake on a crust of cookies, and I’m all about that contrast. I also could have made a Bavarian cream to top the cheesecake with, as Cheesecake Factory does, but that’s too much effort for me. And anyway, I always felt like the Bavarian cream layer was too heavy for this light, sweet dessert. Whipped cream is more its style. 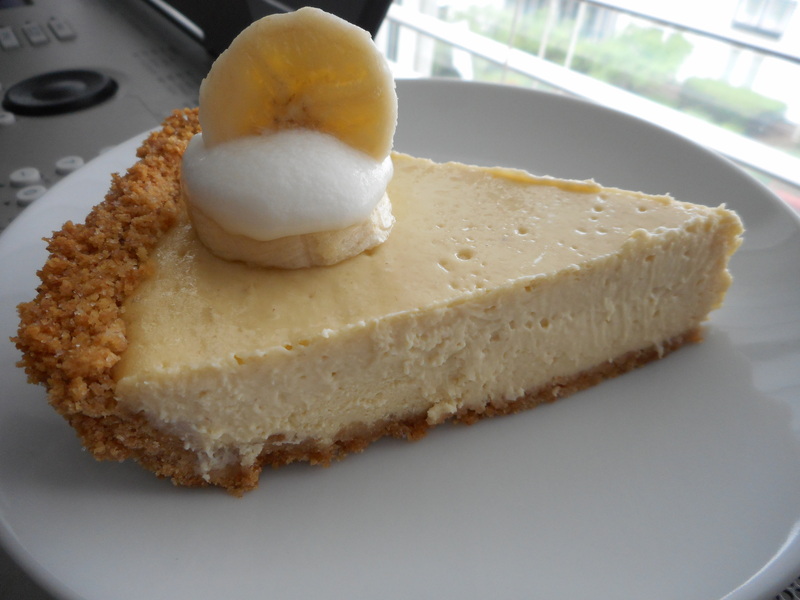 So here it is, a simplified banana cheesecake, my way. Remember that I make my cheesecakes in a pie pan because there’s no way I’ll ever finish a springform pan’s worth of cheesecake, so if you do want to make the full amount, I suggest you double the recipe or, if you’re okay with some slightly different proportions and ingredients, you can wander over to the this recipe. For the filling: Lower the oven temperature to 325 degrees. Cream together the cream cheese and sugar until combined. Add the cornstarch and then beat in the eggs, one at a time, and then add the vanilla. Beat in the mashed banana and stir until it is smooth and fully incorporated. Pour the mixture into the crust and bake for 25-35 minutes or until the center is just set–the center should only move a little when jostled. Depending on your oven, this may take longer to achieve (it took me 37 minutes).